Love is in the Air! This Valentine’s Day we are creating fresh floral arrangements with the most romantic blossoms. We will be delivering these beautiful flowers throughout the Boston area. Life is the flower for which love is the honey. This spring, we are celebrating the tulip! They have so much personality and are so pronounced in their movements. Did you know tulips continue to grow in their vases, even after their stems are cut? There also seems to be an endless amount of gorgeous tulip colors and varieties. So this Mother's Day, we are offering bouquets and arrangements of fresh flowers, baked treats, and handmade vases for local delivery in Boston and surrounding areas. Tulips will be front and center. 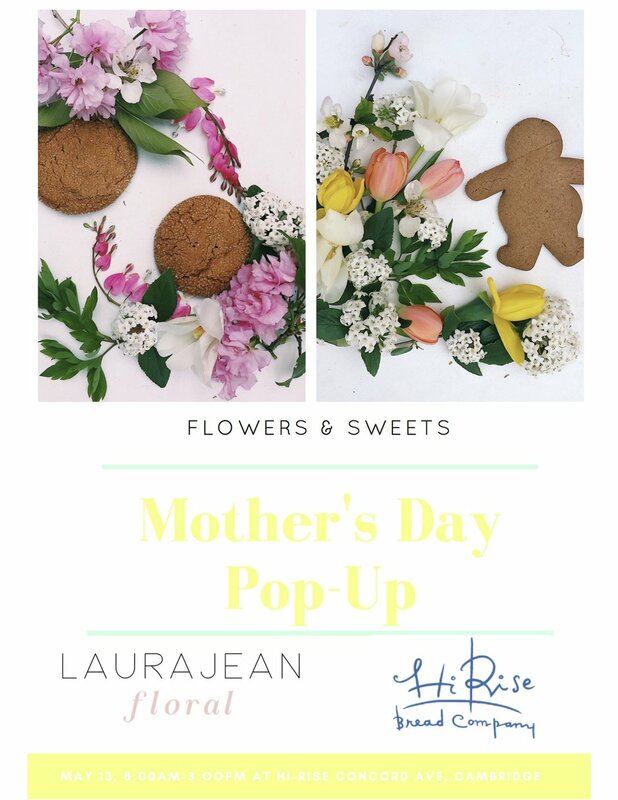 We are also excited to pop-up at HiRise Bakery in Huron Village, Cambridge, for Mother's Day again. It's so much fun to make hand tied bouquets and gift wrap arrangements for all of those powerful and strong women who bring life into this world. We are so excited to announce our collaboration with Drumlin Farm Wildlife Sanctuary, this summer! We will be teaching a floral arranging class at the sanctuary, Tuesday, July 24, 2018, from 6:00 pm - 9:00 pm. Join us in harvesting fresh farm flowers from Drumlin's beautiful fields, to create your own unique bouquet to take home. Instruction will include floral processing and techniques to tame wild flowers, as well as sculptural design tips. Spend a summer night with us in fields of flowers! Tickets are available at massaudubon.org No previous floral design experience necessary. Light refreshments will be provided. This Boston florist is so over this winter! When the temperatures dip below freezing, we can't help but dream of summer, with fresh bright blossoms and beautiful fruits! We love adding an unexpected treat to all of our designs; and, we felt that apricots were the perfect touch for this delicious photo shoot! 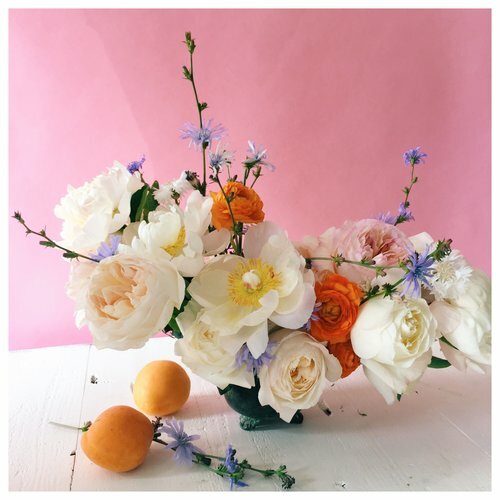 Peonies, garden roses, ranunculus, begonia blossoms, chicory, and apricot. This design was inspired by the natural movement of the garden rose. Garden blossoms are so fragrant, plush, and loose. We love designing with those attributes in mind. The summer season lasted so long this year, so we decided to celebrate it with one last photoshoot with some colorful blossoms and very some very talented women. Bright palettes can be so much fun to work with, especially when you play with textural elements in addition to focal blossoms. Studio Nouveau captured the spirit perfectly in these photos- Strong, Bright, and Bold.